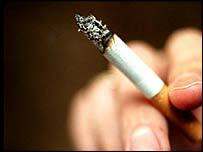 Smoking cigarettes causes the same changes to the brain as using illicit drugs like cocaine, a study suggests. US researchers compared post-mortem brain tissue samples from smokers, former smokers and non-smokers. Their findings, published in Journal of Neuroscience, suggested smoking causes changes to the brain which are evident years after someone has quit. A UK expert said the changes might explain why smokers found it hard to stop - and why they then relapsed. The researchers from the National Institute on Drug Abuse (Nida) looked at samples of human brain tissue from the nucleus accumbens and the ventral midbrain - brain regions that play a part in controlling addictive behaviours. Eight samples were taken from people who had smoked until their deaths, eight from people who had smoked for up to 25 years before their death and eight non-smokers. All died of causes unrelated to smoking. The scientists looked at levels of two enzymes - protein kinase A and adenylate cyclase. Both translate chemical signals, such as dopamine, which exist outside the cells, into a form that can be understood inside. Smokers were found to have higher levels of these enzymes in the nucleus accumbens, a part of the brain that processes information related to motivation and reward, which virtually all illicit drugs act upon. But levels of both enzymes were also found to be high in the area of the midbrain that responds to dopamine, which acts as a "reward chemical" in smokers and former smokers. The same changes had previously been seen in the brains of rats given repeated injections of cocaine and morphine. Writing in the Journal of Neuroscience, the team led by Dr Bruce Hope, said: "The present study confirms that drug-induced neuroadaptations [brain changes] observed in animals can also be observed in humans." The researchers suggest that the differences seen in both smokers' and non-smokers' brains "may contribute to long-lasting alterations in nicotine-induced reward and addiction in humans". The researchers say this suggests that the changes persist long after smoking has ceased and could contribute to drug relapse. Dr John Stapleton, of the National Addictions Centre at King's College London, said: "It would be surprising if taking large doses of a drug such as nicotine many times a day over many years did not result in lasting changes in the brain. "The new results may take us closer to understanding these changes. "The key question remains as to whether such changes are partly responsible for the intractable nature of smoking and relapse after many months or years of stopping."